There are exact replicas of the locomotives that were used when the last spike was driven. The locomotives are called Jupiter and the No. 119. The Jupiter burns wood, and the No. 119 burns coal. There are also replicas of the last 4 spikes driven and a small museum of exhibits showing things about how life was in the 1860's. You can watch a 20 minute movie about the history of the golden spike, railroads, etc. The Driving of the Last Spike is reenacted during the summer season. To allow visitors to relive this celebration, volunteers portray the dignitaries who were at the ceremony on May 10th, 1869. Reenactments are held Saturdays and holidays, starting the first of May through Columbus Day, at 11:00 a.m. and following the 1:00 p.m. Steam Demonstration. On May 10, 1869 the Union and Central Pacific Railroads joined their rails at Promontory Summit, Utah Territory and forged the destiny of a nation. Golden Spike National Historic Site shares the stories of the people and settings that define the completion of the first Transcontinental Railroad. The First Transcontinental Railroad was a 1,907 mile (3,069 km) contiguous railroad line constructed between 1863 and 1869 across the western United States connecting the Pacific coast at San Francisco Bay with the existing Eastern U.S. rail network at Council Bluffs, Iowa on the Missouri River. The rail line was built by three private companies: the original Western Pacific Railroad Company between Oakland, California to Sacramento, California (132 miles (212 km)), the Central Pacific Railroad Company of California eastward from Sacramento to Promontory Summit, Utah Territory (U.T.) (690 miles), and the Union Pacific Railroad Company westward to Promontory Summit from the road's statutory Eastern terminus at Council Bluffs on the eastern shore of the Missouri River opposite Omaha, Nebraska (1,085 miles). One of the most interesting things to know is that the railroad companies actually built an extra 250 miles of parallel grades because there was a fierce competition between the two railroad companies for subsidy bonds and land grants. For each mile of track laid the government paid twenty square miles of land and issued subsidy bonds worth many thousands of dollars. There are 250 miles of parallel grades (not completed in all areas) from Echo, Utah to Wells, Nevada. No parallel track was laid. GPS Coordinates Golden Spike National Historic Site is located at latitude - longitude coordinates (also known as lat-long or GPS coordinates) of N 41.62048 and W -112.54747. Notes: Visitor Center hours are 9:00 a.m. to 5:00 p.m. daily. 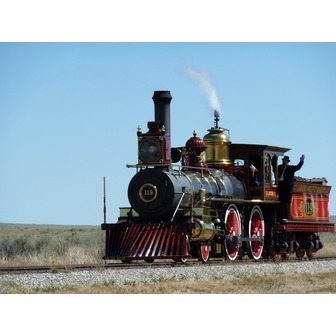 Golden Spike National Historic Site will be closed New Year's Day, Thanksgiving Day, and Christmas Day. Outside attractions are open during daylight hours. The two trains are pretty good replicas of the originals. Unfortunately, they don't let you ride them, but you can walk around and take photographs.